Fanged creatures secretly prowl among us, lurking in obsidian shadows, quietly watching us from behind dark sunglasses, their narrowed gazes fixed upon luscious prey. The vampireâs excruciatingly sharp needle-like fangs flash under the moonlight as he grabs his victim, one hand over her mouth, the other tightly wound around her waist. He strikes deep and violently. The victim moans with ecstasy begging for more even as the tears stream down her cheeks. Really? Is this merely heart-throbbing fantasy? Are fictional vampire movies and books based in truth? What is pure fiction or folklore and what is not? If there is such a thing as vampires, what are they like? What is the vampire reality? In the 1960âs, real vampire Houses were far underground and rarely known, even amongst the real vampire community. Occasionally, Satanist and Wiccan covens harbored a vampire member or two. In 1975, The Temple of Set (members are known as Setians), an offshoot of the Church of Satan, came into being and established The Order of the Vampyre. The Order of the Vampyre is still active and thriving to this day. There are many vampire organizations and sects that have arisen since the 1970âs, a few being the Temple of the Vampire, the Vampire Church, Temple UVUP, the Red Order of Set, the Ordo Azariel, the Aset Ka, the Black Order of the Dragon, and the Strigoi Vii. There are numerous vampire Houses, Covens, Courts, Councils, and Halos. There are a few Houses and Councils in the United States who have blood ties to Eastern Europe. One Council dates their lineage to Vlad Tepesâ Order of the Dragon. For those who do not know, Vlad Tepes III (or Vlad Drakul) was the infamous Prince of Wallachia, also known as Count Dracula. The Tepesâ were known as the House of Drakul. Drakul means devil or dragon. This is of note as vampires have been known to be of the Devil himself in folklore. Not all vampires belong to an organization. Many vampires, in fact, 75% according to the survey conducted by Suscitatio Enterprises, LLC, are Independents or Ronins (http://www.suscitatio.com/forum/gallery/1_09_09_10_7_50_25.jpg). Alas, not all vampires are Setians, Luciferians, Wiccans, Satanists, or any type of occultist for that matter. Vampires come from all walks, from Atheist to Christian to Zen Buddhist. The Atlanta Vampire Alliance in conjunction with Suscitatio Enterprises, LLC have been researching real vampirism and the vampire community since 2005. 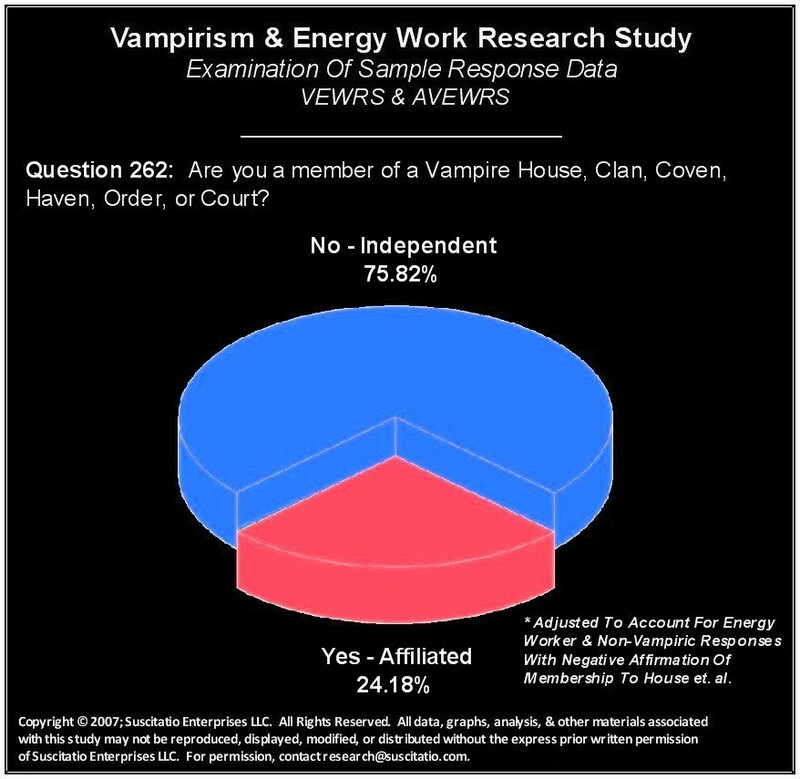 Suscitatio Enterprises, LLC, a research group comprised of real vampires, conducted two surveys, one in 2006 that was answered by over 950 persons and a second in August 2006; these surveys are the Vampire and Energy Work Research Survey (VEWRS) and Advanced Vampirism and Energy Work Research Survey (AVEWRS), respectively. Over a three-year period, 1,450 surveys were completed with over 670,000 answered questions. Preliminary and final analysis of selected questions have been released through their website and in an academic paper by Joseph Laycock published in August 2010. Additional analysis continues as more correlations and future studies are being implemented in 2011-2012 (http://www.suscitatio.com). It is important to note that vampire/vampyre is a self-determined label but a very apt one for todayâs modern vampire subculture (Vampires Today: The Truth About Modern Vampirism by Joseph Laycock). In the 1700âs, there were three unifying beliefs regarding vampires: 1) vampires were real, 2) vampires were bloodsuckers, and 3) vampires must be destroyed. The legendary archetype has evolved and todayâs vampire is neither undead nor a murderer. The modern vampire is an individual who needs either blood or life force energy to maintain physical and mental health. Many vampires have willing donors. The vampire without a donor must rely on substitutes for fresh human blood such as rare steaks and the blood collected during the brief cooking process. Those who are psychic vampires feed in various ways, many by physical touch or by sexual relations with their donors. Some vampires can feed by astral visitation or dreamwalking. Are you wondering how one becomes a vampire? I am sure you are. Only a few have claimed that they were turned or chose to become vampires. The overriding belief in the vampire community is that vampires are born as such and awaken during puberty although awakening can happen much later in life. Awakening is often a difficult process, with mood swings not unlike wild hormonal fluctuations. The sanguinarian (blood-drinking vampire) will have a strong and unrelenting craving for blood. He may gnash his teeth and chew the inside of his gums. Fortunately, there is support in the Online Vampire Community (OVC) as well as the real life community for those who are awakening. Sometimes a donor can be found but most Houses do require classes in anatomy, safe cutting techniques and after care. Testing for blood-borne pathogens is universally mandatory, requiring both vampires and donors to submit test results to the House leader about every three months. Many vampires are nocturnal creatures but must be awake during daylight hours because of family or occupation. Donât be surprised, however, if you see vampires online in the wee hours of the morning. Vampire chat rooms and radio are usually buzzing with activity during this time. Though there are a few who sleep in coffins, vampires generally prefer a comfy mattress. Sunlight and extremes of heat are a problem for many. Migraines and fatigue are very common. Despite a few drawbacks, vampires are regal and beautiful creatures, often charismatic and gifted. They do not live forever but may age more slowly and gracefully than their non-vampire counterparts. So, dear vampires, I invite you to respond with your own vampire reality. Are you sensitive to sunlight? Do you lurk at night? Do you sleep in a coffin? Please tell us what is unique about your own existence. Daring and intelligent readers, has this blog left you wanting more? Are you surprised by what you have learned? Do you look forward to interviews with real vampires and their donors? Ptolema enjoys writing dark poetry, erotica, horror, and expository vampire and occult themes. She is also a Luciferian, impressionist painter and martial artist. Kelly is married and loves living in the country. She is mother to one daughter, one dog and various wildlife. I myself am a vampire, love. I am a hybrid. I drink blood and absorb the energy of others. If one might want to consider becoming a vampire…maybe knowing someplace from inside its their fate…but a long ago fate of a very old vampire race. At least if that’s what they see again & again in their dreams since they were a child. A female child hunted by a adoring male vamp. I know I love him & I think I’m finally ready for ever lasting love with him. How would reach out or join him again. I feel lost without him …I worry something has happened to him as its been awhile since my last visit…. Whilst I may not be hurt by sunlight, I do burn rather easily in the sun. However, I attribute that to my red hair, mostly. I’m mostly awake at night, finding the late-morning hours to be akin to late-night hour, for most normals. I do know someone who sleeps in a coffin, and, I’ll admit, it’s comfy. But there’s something about being inside it that’s a bit of a rush. As far as aging, I look to be about half as old as I actually am. “Are you sensitive to sunlight?” Only sometimes. I’ve got enough Cherokee blood in me that the sun doesn’t bother me too much. “Do you lurk at night?” I used to, but my husband’s work schedule requires me to go to bed around midnight. “Do you sleep in a coffin?” No. Never. But, the condition of my mattress is bad enough it could be called a coffin. “Please tell us what is unique about your own existence.” I’m a sang/psi hybrid vampire. My husband is my donor. I’m not satanist. I don’t even believe in satan. I’m not gothic, either. I’m more of a hippie. I eat vegetarian about 75% of the time. I have an organic garden in my yard. I’m an independent vampire who has been active in the OVC for about 4 years. “Daring and intelligent readers, has this blog left you wanting more?” Yes. “Are you surprised by what you have learned?” The only thing that surprised me is how the writer lumped wiccans in with vampires. Let me make something clear: wicca is not a vampire religion. While some vampires may also be wiccan, most wiccans are not vampires. “Do you look forward to interviews with real vampires and their donors?” Yes. We rarely hear from the donors. These are wonderful people who know the risks involved in bloodletting who selflessly give of themselves so that another may enjoy a better quality of life. They don’t get the recognition they deserve. I would wish to turn into a vampire but i want to keep a good catholic.what can i do?please help md. I do dress gothic, but that is a personal choice. I’m a hybrid vampire (both psi and sanguinarian, I need both energy and blood). I am extremely sensitive to the light, to the point where I actually carry an umbrella around outside in order to avoid being burned. My eyes can’t handle sunlight, but I have excellent night vision. I’m still in highschool, so insomnia is a serious issue. I’m lucky if I get four to five hours of sleep a night. I feed on blood and energy with more or less equal frequency. I sleep in a bed, though at times I’ve felt like sleeping in the closet. I would TRY sleeping in a coffin, but that has more to do with me being gothic and freaky rather than my being a vampire. you seem interesting.. how did you become a vamp? does it just come are you born with it? i realy want to become a vampire and i have related vampire teeth but not sharp and i have two on the top and bottom and when i have a cut on my body i like tasting and smelling it what am i and i really want to be a vampire?? ?please reply and answer my question?thank you! I understand, I had really nice fangs but the dentist had filed them because I was tarring up the inside of my mouth. but I love the taste. I want to be a vampire for real, not just in my dreams. @Unknown – I guarantee you there are vampires in Kansas City! @s – I burn quickly as well being fair and of Irish/Welsh descent. Over the last few years, I’ve developed polymorphous eruption. It seems to happen a few times and then I’m ok (burns like heck though). @Autumn – You are a sweetheart for answering questions. We finally got rid of our old mattress and bought a memory foam one from Sam’s Warehouse Club website. It’s inexpensive and works great. The downside is there is no headboard. How true it is that Wiccans are not necessarily vampires. In fact, most are not. I apologize for any unintended inference. Not all Satanists believe in Satan either; many are atheistic Satanists. Personally, I am Luciferian (we do not believe in deities at all and we do have vampiric paths but I don’t follow the vampire path within Luciferian itself. @Zero – Thank you for the feedback. I love goth dress and have a few cool things to wear here and there. Having excellent night vision is very common among vampires. I always wondered what it would be like to sleep in a coffin. As a real vampire, I have not met with many others except for the few inependents. “Are you sensitive to sunlight?” I am sensitive to sunlight, but i avoid that by wearing a lot of sunscreen. “Do you lurk at night?” I do when I can, but I’m in high school and therefore need my sleep. “Do you sleep in a coffin?” I used to but grew claustrophobia due to an elevator accident. “Daring and intelligent readers, has this blog left you wanting more?” Frankly, yes. Although the passage contains good information, some of it seems misleading. “Are you surprised by what you have learned?” Well, as stated previously, some of the information seems misleading. “Do you look forward to interviews with real vampires and their donors?” Yes, because I do not know much of vampire culture and wish to know more about the relationship of such an intimate sort that is only seen between vampire and donor. Thank you so much for taking the time to comment and answer a few questions about yourself. I always wondered if sleeping in a coffin would be claustrophobic. So, source blood makes you squeamish. Not good and maybe you can overcome that. As the author of the article, I invite you to tell me which areas you thought were misleading. I’d like the chance to clear up any misconceptions or admit an error if I made one. From what I’ve found sleeping in the closet, it’s really now that bad. I used to have a cubby hole that had the same dimensions as a coffin. It was actually kinda comfy. I can visualize the coffin lid closing, most likely because of the countryside funerals I attended as a child and teen. We had graveside services where someone would ask to see “grandma” one last time. So, the minister would pop open the lid and we would file by (I was forced to) to take a last look. I always thought I might fall in the hole next to the coffin. In fact, I wrote a poem about my experience, grim yet funny. I’d think a coffin would be nice and quiett. And a coffin should accommodate two, lol. the information that seems misleading is the fact that the modern culture views vampires as those who are not murderers. more often then not, at least in my experiences, when somebody realizes what you are, they are frightened , not amored. occasionally, however, they are and can lead to unwanted complications which can therefore lead the slayer society to whereever it is that you are located, causing danger to you and those around you. You misread what I was saying. The modern vampire is not a murderer. Fortunately, the Rod Ferrells of this world are few. And they probably aren’t vampires either (the murdering psychopaths of today who claim to be a vampire). The Vampires of folklore were murderers. The archetype of the vampire has evolved. this article was really interesting, and i found out a lot of stuff. i myself can’t stand the heat and sun for long, half hour most before i start feeling dizzy. and i love being up at night, it is the best time of day but with school its hard for me not to sleep. and my night vision is really good, most people think im crazy for being able to see almost everything in the dark. i have never slept in a coffin, my parents would freak out on me. but i think it would be cool if nothing else. If you ever try sleeping in a coffin, make sure it has ventilation. I’d think a coffin would have a good air seal and that a person might suffocate but I don’t know. There is disagreement in the vampire community regarding sunlight, being nocturnal, having night vision, psychic gifts, etc. This is all very pitiful and pretentious. You come here to boast about being a vampire? that is essentially what your doing as you know you would not be able to share this fantasy with your family and friends. I blame TV shows like true blood and films like twilight for this fad. I can tell you there is nothing good about being a vampire. It is a life of pain, secrecy and self loathing. A vampire would never reveal his or herself. There is no reason to. Be careful what you wish for. If you read the links above you will see that the vampire community is huge (in the USA) offline and online. Vampires do reveal themselves to one another. We have courts, councils, and houses. And we don’t sparkle. Threats of “be careful what you wish for” are not appreciated. Don’t confuse today’s vampire with the archetype from the 1700’s. I would be careful there Marta… not all of us are as patient as Kelly, there. I would watch my writing if I were you, otherwise it would be considered as libel or offensive. You are now being watched. Personally, I take exception to the word, “condition.” Vampires are gods, not parasites. You know? Yes, How pretentious you are Marta. Holding your nose up in ignorance is always pitiful… one figure that you can’t be that old. true blood and twilight are new, some of us in the community have been around quite a it longer than that , and i recall, in the 80’s that there was a community, before me, and the internet etc etc. so that would show ignorance on your part. perhaps you might do a bit more research before posting places. we have quite a but of anonymity so we can simply pop up anywhere and help others that are a going a bit wayward and need direction, that is what many use the internet for as well as networking with others . some of us including our friends and family are vampires or we share it with a select few in person got to eat. Thank you, D, , . Real vampires and the vampire subculture are nothing like the vampires portrayed in films and TV shows. They aren’t immortal, they don’t have super spectacular powers, or anything like that, that is all make believe. But there are in fact vampires out there, they just aren’t like those shown in entertainment and they are well aware of that. Also, it’s not a fad, it’s something that has been around for ages, it’s just been all hush hush and underground, now people aren’t hiding it as much. It’s ignorance like yours that makes people want to hide what they have no reason to hide. You should try being more open minded. Just because YOU don’t like it doesn’t mean that there’s anything wrong with it. Those in the vampire community aren’t doing anything wrong and for you to say otherwise is ridiculous. I enjoyed your post! Im writing a book. But I have been changing. I used to b a sun worshiper. Now the sun hurts my eyse and causes me to get migranes. I died 4times. Dr saved me,and was given 47 units of blood. I dont sleep at night anymore. a few naps during the day. I stopped speaking to all of my friends. What is wrong with me? I dream of people who have died, they tell me things and they happen. I feel like im loosing my mind. I feel an evil presents in my home. I have been waking up when i do fall asleep and cant move. when i awake in this state it feels as if somebody is pushing on the left side of my head and I cant move it. I also see a black mist in my room at nite. I become so scared i cant move. My mood ha changed my temper is getting bad. Before I became sick I was in Russia for a few month in the southern region, I met a few gypsies who were nice. They blessed me.when i came home i began bleeding and has my uteris removed causing the bleeding and blood transfusions. Any help would be helpfull please. I’ve known Kelly for a while now, she is a respected and influential person in not only the Vampire Community but also in the Occult Community. I’ve never known her to shoot her mouth off, boast or ever speak about something she was not already quite familiar if not an expert in. Kelly has never hidden her pursuits and studies from anyone, her husband, family, friends and community are well aware of her research and Beliefs. The vampire archetype doesn’t exist within Hollywood, Kelly is fully aware of this and knows the difference. There is nothing painful, secretive, or self-loathing about vampirism, to think this is to place vampirism back into the fictional realm you have rallied against. People using the vampire archetype, believing themselves to be vampires, actual vampires, and other aspects of vampirism has been coming out of the ‘coffin’ so to speak for several years now. The reasons are obvious, a need for Community and Brother/SisterHood. i think all this vampire information is very kool and interesting. i’m no vampire but i hav a friend who told me she was. i personally didn’t belive her, not because i didn’t belive in vampires, just because she jokes around alot, but now i do. she’s nothing liek in the mvoies, but she does have some extensive abilities. i respect you guys so much, but i do hav questions. i dont wnat to ask or offend anyone tho :) you guys rock point blank! Thank you for the kinds words. You can shoot me a PM at forum.darkness if you like. I’m Kelly on the site. I came upon this site while researching vampires for a fresh-perspective novel I’ve been wanting to write in order to explore alternative and sociological ideas about this popular creature out of folklore. My thinking was this–most myth has its basis in fact, albeit muddied and confused by the passage of time and the imperfect observations of and/or deliberate clouding of these facts by people. Imagine my surprise when I found myself identifying with many of the traits described by articles written by people like you, Kelly, who have lived the “lore”, as it were. I have always secretly craved the consumption of blood–from rare meat down to the letting and drinking of my own blood. I and others have attributed this behavior to Obsessive-Compulsive Disorder, and it is interesting in that this craving is indeed overwhelming and its satisfaction IS compulsory. I have hitherto controlled it with anti-anxiety medications and mental exercise, but to be honest, it never goes away. I have always been very anemic, prone to fainting, and sensitive to the violent emotions of others. Sunlight never bothers me, however; rather, it makes me feel sleepy. A weak immune system, extreme daytime fatigue and nighttime insomnia, extreme pallor of the skin, a low body temperature, and general circulatory problems have been present since the onset of puberty, which for me was relatively late. I have severe social anxiety despite having been quite popular throughout my life, and being surrounded by people is exhausting to me. I have worked in vastly different fields, bouncing back and forth between extreme social exposure (performance arts) and very little (electrical work) as my constitution changes. Another article I read mentioned the dynamic relationships which occur between vampires and nonvampires, and that individuals who are considered to be vampiric can often be said to burn through relationships quickly, leaving others emotionally drained and confused. I’m sad to say that I am guilty of this trait. I don’t know whether any of this is meaningful or indicative of vampirism, but I wanted to share my thoughts on this post, to give feedback to the author and also invite the opinions of those who are, like her, accustomed to and well-versed in this sort of thing. Are all of the traits I described simple psychological misfires and physiological bad luck, all of it coincidence? Or is it vamprisim? Indeed, is vampirism just a word which encompasses all of these things? A category for a subgroup of people who share common features? I think it must be. I have never been able to talk about this with friends or family. I’m 22 years old and I’m sure they’d think I was making an attempt to fit in with a popular culture out of feelings of loneliness and the typical feeling of having no place in the world that is attributed to my age group. Perhaps they would be correct. Regardless, I would appreciate the opportunity to discuss this with the like-minded people who have been responding to the author. I can’t say for sure what is and has been happening to me, but it sounds an awful lot like what I’ve been reading about here, and if there is any way to make it more bearable and understandable, I’m all for taking action. What I am craving now is information and direction, and a reasonable, logical approach to accepting a strange, isolating situation. Thank you for the kind feedback and your courageous reply. Vampires throughout the community have varying symptoms when we need to consume blood or psi energy; some are affected more severely than others, even taking on pallor or an ashen appearance; some really do become quite ill. Genetically, I’m very fair, thanks to being Irish and avoiding the sun; many do avoid the sun, hence the paleness. Personally, my biorhythm is nocturnal. However, these traits are shared by mundanes (nonvampires) as well. We can’t scientifically say these are vampire traits per se. I’d like to say that I never consider myself as having some disease-like condition. If anything, I’m quite strong in all aspects. Vampires are just…different. There are those of us who believe our condition is spiritual while others believe it is genetic. We really don’t know. Medical research is being undertaken, howeve,r and maybe one day there will be answers. The answers might even lie in epigenetics. Certainly, vampires are not of the emo goth movement but awakening can be hard emotionally. And not having donors is tough. As far as isolation, not fitting in, vampires know they are different. But so are musicians, writers and artists. There are traits that just set people apart from the sheeple around them. I view vampirism as a gift, personally. Please contact me at forum.darkness (a subsite of vampires.com). I’m Kelly at the site. I’d be happy to help you with direction. Thank you, Kelly. :] I appreciate the time you took to read such a long comment, and your offer of help. I will contact you! hi,i like 2 knw more about vampires, sumtym i usd 2 thnk of becming a vampire..is it ryt wat i m thnkng n wat i hve 2 do 4 becoming a cute vampire like kelly..?? That’s not entirely true. There is a small faction of vampires in the community who believe that “turning” (causing a condition that very closely mimicks vampirism, but is permanent) is theoretically possible. Mostly accomplished through energy work. There is an even smaller minority who claim to have done it, have been turned, or have seen it happen, such as the likes of Lady CG and others. The reason it’s scarcely discussed is because new vamps are fed the party line of “there’s no such thing” which is a shame, because according to those I have talked to, it can happen quite on accident. Turning used to be discussed a lot. Whether is became taboo when we started to come out or not is anyone’s guess. @Zero – you are right. I’m familiar with two small classical sites, and know some who claim to be Haemavore, Classicals and Ageless believing that the change is caused by a virus that acts like a prion..
Also, the mind is a powerful thing and can probably affect the physical body, too. Eventually that may have had (or has had) an affect through epigenetics. I just don’t bring up the topic much because it incites flaming and division in the community. I might add, too, that I’ve gotten myself into a semi-sticky situation by investigating those communities. I like to play with fire and my curiosity gets me into trouble. Is it really possible that vampires are real? As in real, not fiction? I think I am a believer and that’s quite rare in my country although it is called “the land of Dracula” people simply prefer not to believe in anything that it’s rather “sick” according to their standards.And it’s really hard to tell when these discussions are real or not. I’ve seen a lot of people who call themselves vampires but they are really I don’t know kids having fun in front of the computer and so on. Well, Ive always wanted to meet one in person because I’ve studied Mythology my entire life and it’s a fascinating subject. I’m writing a book now about supernatural and the way people see things that they can not understand. I am personally amazed that people can believe in god with so much strenght although they’ve never seen him, but refuse to believe in other myths. If you can tell me more, I’ll wait for your response. Today’s modern-day vampires are nothing like the archetype of the Upir/Vampir in eastern European folklore. Vampires are not undead nor do they kill (though there are psychopaths who have killed and claimed they were vampires). To know more, you can read some of the forum posts at forum.darkness or visit some of the real vampire sites. This article is well written for those just awakening and those new to the community. I am a sanguinarian vampire. I am sensitive to sunlight and extreme heat and so I have migraines and I am fatigued during the day. I prefer being awake at night because of that. I am not surprised by what I have learned but iI am looking forward to reading future articles. There will be upcoming articles, such as interviews with vampires (and hopefully donors) as well as articles on the structure of the vampire subculture such as Houses and Courts. I hope to cover issues within the community as well. Your symptoms are very common in the community although there is infighting about symptoms. Lol. Thank you about the informations. I’ll check those forums out. “Are you sensitive to sunlight?” Kind of… I burn really easily, and from that I get a dark olive tan… but after a day without sun, my skin goes straight back to ivory white… Also, sunlight hurts my eyes. “Do you sleep in a coffin?” I would like to try it, but I enjoy soft mattresses better. “Daring and intelligent readers, has this blog left you wanting more?” Definitely. “Do you look forward to interviews with real vampires and their donors?” Of course! Some do have have enhanced strength or speed. Some have better night vision. Some have psychic abilities. Hey guys please just tell me the truth. Do really Vampires exist?? I do believe in vampires but there is confusion. What all extra they have?? What are there deficiency?? Please tell because my best est friend ever is saying that i am in trouble from a vampire, he is very serious and i even sure he is not telling lies. As he took my promise. Please tell me all the truths about vampires. And please tell me how a person would be able to be turned into a vampire?? Last question do vampires have long teeth?? I am from India. Please don’t ignore. Do reply to my post. Sorry for the delay. I just saw your post. You are not in danger from any vampires. You may be in danger from psychopaths. No, people cannot be turned into a vampire. Vampires generally do not have long teeth. A few are born with long teeth though. A vampires deficiency is energy (chi, prana, ki). In general, vampires are a little stronger and faster. Some have psychic skills. Many will disagree with this statement. You see, we argue amongst ourselves. Hi, I’m a young 13-year-old teenager going through puberty right now. I have been very depressed, moody, but in a sense “awakened” in my psychic abilities; with a desire for blood way before I got into this vampire stuff. I love the dark and the nighttime, gothic, creepy stuff. I honestly think something’s happening, that I’m being awakened into a psychic vampire from everyones’ descriptions. My mother is kind of psychic in a sense; she can tell when something is going on especially since I am her firstborn. If anyone has any advice for me, I’d really appreciate it. It’s painful to have to screw on a smile; but at the same time I don’t want my family to worry. My, you are quite articulate for a 13-year old and so intelligent. I suspect it is hormonal fluctuations you are experiencing. Only time will tell. Any vampires in the wisconsin area? i want to be changed or know if im in the process of becoming one, a lot of dreams and thoughts have me very curious.. There are vampires in Wisconsin but you cannot be changed into a vampire. If anyone says they can change you, run…they are a psychopath or sexual predator. Also, why would you want to be changed into a vampire? Modern-day vampirism is quite different than the tales. I would suggest you go to forum.darkness.com and check out some of the real vampire videos in the Supernatural section. Kelly, please get in touch. kelly u said people dont turn into vampires so these moivies like vampires daires isnt portraying the truth. So that means you must be born a vampire. If someone wants to be a vampie what will the person do? Kelly pls answer all my question turn by turn elaborately. i really want to become a vampire bcoz people thjnk that they r noy real in this world n my family also don’t bleve in me to become a vampires. im a sickly person i think. but im normal in nutrition tests. i have insomnia cant sleep till dawn and wake up 10am then migraines and fatigues attacks me everyday and anytime of the Day.my favorite dish is cooked blood of pig.it can be chicken, goat, cow but prefer pig it smells better.i love wearing aprons!.i appreciate old stylish ones.i stay in my dark room and sleep or play flute and piano everyday.i always wonder how human blood tastes like but i think its gross because .some.humans smell bad…im vegetarian too of course. sleep in coffins? its kinda creepy..im not so socially inclined..
my family teases me that im a ZOMBIE…hey maybe some people pretending to be vampires are actually zombies too!! LIKE ME. agree?.. @vampire……..real vampires, kindly reply Question:are werewolves your enemies? Werewolves (therianthropes) are not an enemy of the vampyre. The clash makes for good stories though. Our vampyre House even has a therian guard team. I have always admired vampires since I could remember, I’ve had the dream that I was turned and it felt so real. I always have dreams that I am a vampire, I wish it could be. I know I would make a great vampire all I need is to be turned. So . . . has anyone ‘transformed’ another into vampire here? LOL! Is there any vampires in Ohio ? If so where would I find them? Is there any vampires around my age ? well I am 35 years old. I am from Nepal. Its underdeveloped country. There are many dense forest around here. At night time after 10 many people see vampires. Me too. Yes they are white and gets shine in full moon. They don’t wear clothes and communicate in there own language cannot be understandable. How do you know they are vampires? A real vampire need not prove his identity. I have humorous regards to all this. If you know what you are and you’re confident with it, there should be no need to go about parading on your vampirism. It is the sole fact of how completely non serious the common person regards true and honest vampirism that people are not being turned. Excellent article, and thank you for, in such a brief and concise article, dispelling some of the Vampire myths. Unfortunately mostly perpetuated by Twilight and True Blood type television / movies. There is nothing wrong with such entertainment, as long as people understand, and enjoy, these type of movies / television programs as such; purely entertainment. for all those vampire lovers out there my name is selene and i am a vampire i was born from the year 1862 and 1 true fact about us vampires is we do have a human heart but just frozen in the time we were reborn so are heart is truely cold as stone but we are caplebul of feelings and the knodlede we have is beyond the years of many for ex. i have already learned 21 diffrent langueges and still i feel incomplete waiting for the right moment to find the one person i can be with. selene means goddess of the moon and lonelyness whicth is so true in my eyes. How do you become a Vampaire !!! I have long since came to terms with what I am. Yes, one is born a vampire. In my case I was well aware of the fact at a tender age long before puberty. Of course in those times to speak of such things would prompt a one way ticket to the rubber room, unlike today , when everyone feels the “need” to come out of whatever proverbial closet they may be hiding in. Back then , I had a hard time dealing with it , as I was so young and was alone in my efforts to cope. However, as I matured I found ways to adapt and I had never felt the need to openly display what I was to a paranoid and fiction driven society and still don’t. I also find it difficult to discuss certain aspects of our nature, because to me it is private. I will however say, if you are one , you will know it , especially if you do not get what you need. It is simply part of who you are, as with anything , with the good also comes the bad. Bottom line , if you embrace who and what you are, loving it , nurturing it you will be able to live in harmony with it. Really haha born.. proverbial closet… you really think your a vampire xD Go rethink for yourself that’s the nicest way to put it. Yea I totally agree with you. I just tell my story to explain to people that it is possible. I knew I was different at the age of 8 didn’t know why but age of 13 I knew kind of why then 15 I was sure I am a vampire. I was actually looking for answers to the weird dreams I’ve been having (nothing to do with this subject) got slightly derailed when I came across a strange website regarding REAL vampires. It sucked me in, didn’t think it would, as it seems slightly… Crazy. Anyway I like a rare steak as much as the next girl but im no vampire, how would you know anyway? Do you just suddenly want to bite your mate? Question so I love getting blood drawn. Also the taste of blood. But I’m no vampire. Can u happen to turn me into one please? And how would it be done? Hey Kelly! Are there any vampires in the Philippines? Can someone be a Vampire, awaken and still be oblivious to ever being one!? Because I have a friend who is a vampire and she keeps saying that I am a Vampire myself, but I am not so sure. I am a 24 year old male, I live in the United States of America and I look like I’m about 18 or 19 years of age. I have a desire to work for a better world for all beings, both real and as most people would declare “Mythical”. I get random sensations and urges that come over me. I get sunburned very easy and I feel almost like I never want to sleep, but I know that even Vampires need sleep as well. By the way; is it at all possible for Vampires and Lycanthropes to be related and/or be close friends? I ask this, because I have a friend who as I said is a Vampire and she told me that vampires, Lycanthropes and Succubi are all very real as are fairies, elves and Pixies. Are all creatures and beings that the world consider Fairytale or Mythical considered to be real!? Yes vampires who are born vampires have an awakening and some do not know it until later now the things about Lycanthropes and Succubi their not real alot of people will say other wise but their not real. Now them other things they are up for you to figure out I believe that they are real but others again disagreed. No its not you’re talking to someone who has a hard time forgetting everything any anything. If you truly believe that then I am sorry. I think I would know the truth and there is a difference from being born a vampire and turning into one. So let me ask this, respectfully, what’s the difference between a vampire and an average Joe who drinks blood on occasion to try to fit into a gothic subculture? Why would anyone believe what anybody on here is saying? Why should they?